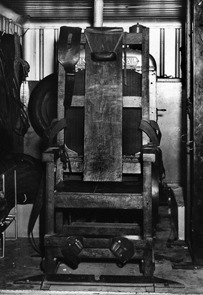 America’s weird love-affair with Frankenstein execution technology has been an occasional theme on this blog, but the fact is that the old-school execution methods these ghastly machines replaced were unpleasantly hit-and-miss. One is attracted most readily to the firing-squad execution of murderer Wallace Wilkerson in Utah. Wilkerson appealed the constitutionality of this method of execution, and in 1879’s Wilkerson v. Utah, the U.S. Supreme Court held that “the punishment of shooting as a mode of executing the death penalty for the crime of murder in the first degree is not” cruel and unusual punishment. This legal precedent has actually been cited* by the present-day Supreme Court in rejecting legal challenges to lethal injection. Which is ironic, because a couple of months after the high court issued Wilkerson v. Utah, Wilkerson suffered a very cruel execution indeed. The doomed man talked the officials conducting his execution into allowing him to die without being strapped down. With the resultant range of motion, Wilkerson at the last breath before the fusillade hit him drew his shoulders up as he braced for the impact — and pulled the white target pinned to his shirt above his heart. ST. LOUIS, Mo., May 16.–A special dispatch from Booneville, Mo., says: “John I. West, who murdered a tramp last October, was to-day hanged at the Old Fair Ground near this city. When the trap was sprung, at 11:41 A.M., the rope broke, and the culprit fell to the ground on his back, but was too weak to rise. His groans and the gurgling sounds of strangulation were terrible to hear. He was picked up and speedily raised to the trap again, and, while being held by four or five men, was dropped a second time. This time he swung, and in 11 minutes was pronounced dead. 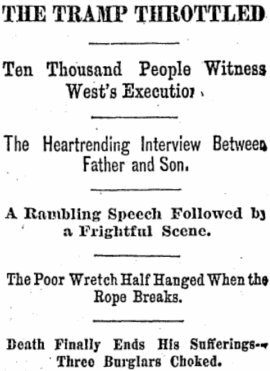 After reaching the platform of the gallows, West spoke nearly half an hour to the crowd present, reiterating his confession of the murder of Shinn, reviewing his past life, and appealing to young men and women to take his fate as a warning. There were about 8,000 people present, among whom was the father of West, who had come from Chapin, Ill.
Hillsboro, North Carolina, held a first-ever triple hanging — of the “Chapel Hill burglars”. As you might guess, these gentlemen burgled, and said burgling occurred in Chapel Hill. It was for housebreaking, not murder, that they were condemned, with the help of a confederate who turned state’s-evidence against them as soon as the lot was arrested. Each of the culprits proclaimed his innocence to the last moment. [Lewis] Carlton spoke for an hour, and said his salvation was sure. The parting between [Henry] Andrews and his sister on the scaffold was most affecting, and moved the crowd of witnesses to tears. All the doomed men bore themselves firmly, and showed no signs of wavering. The hanging took place at 2:30 P.M., and was very badly conducted. The ropes around the necks of [Henry Alphonso] Davis and Carlton were too long, and their feet rested on the ground. They were raised up and the ropes retied, causing death by strangulation. [t]he execution was romantic in the extreme. Just as the doomed men ascended the platform a murky cloud, which had been drifting around, hung over the crowd and the instrument of death. Alfonso Davis began to speak, and as he opened his mouth the thunder began to peal, and the rain came down in torrents. Not a man, woman or child in the vast crowd moved or seemed to be aware that the rain was falling, so wrapped up in the death scene were they. At times the cloud threw such a dense shadow over the scene that it seemed as though night had enveloped the place. Then the lightning, vivid and intense, lit up the field of blood and cast forward, in bold and statuesque relief, the figures of the doomed and their executor as he stood like an artilleryman, lanyard in hand, ready to send the signal of death forward … the souls of three burglars went out and beyond, forked lightning illuminating their way and the wildest of thunder pealing their requiem. The truck was a 1941 International Harvester K–3 two-ton cornbinder, from the manufacturer known at the time for its production of heavy-duty farm equipment. Painted red, it was mounted with a large, gray sheet-metal trailer, unmarked and nondescript. In fact, the only thing odd about this truck was the additional muffler and exhaust pipe that extended from the roof of the van. It would not have turned heads, at least not until it pulled up to park behind a Louisiana parish jail. Then, as photographs show, people would stop dead in their tracks and stare, as if some ancient beast of classical mythology was lurking behind the thick, metal doors. 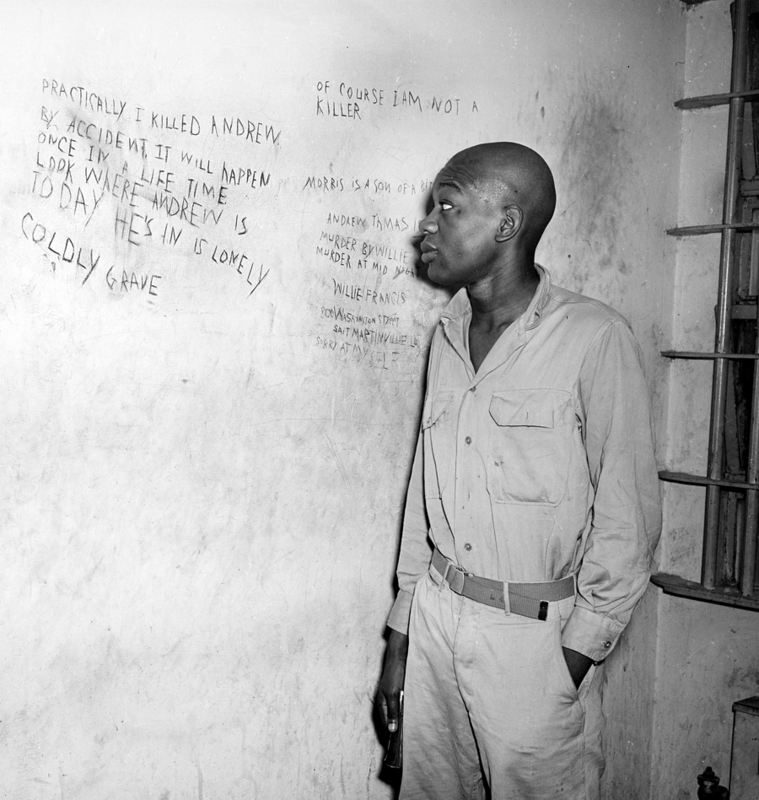 And when Captain Ephie Foster, the Angola prison guard who, on May 3, 1946 had arrived to execute Willie Francis emerged from the truck, they stared at him, too — their somber eyes carefully registering the face of a killer. May 3rd was supposed to be Willie’s last day on earth. His head had been shaved and his pant leg had been torn so that current could cleanly surge through the body of the 17-year-old Louisiana youth as he sat strapped into the electric chair known as “Gruesome Gertie.” But things did not proceed as planned in the small town of St. Martinville. Foster and his assistant had been drinking and did not wire the chair properly on that hot morning, and when the switch was thrown, Willie convulsed and screamed for more than a minute, until it became obvious to everyone in the death room that something was wrong. “I am not dying,” Willie shouted, until finally, the sheriff ordered the electricity shut off. Deputies put Willie back in his cell and Louisiana Governor Jimmie Davis was called as town officials were unsure what to do with the boy who walked away from the electric chair. About an hour later, Davis had made up his mind. Foster was to load the chair back into the truck and drive it home to Angola where it would be fixed. Then they’d send it back to St. Martinville a week later where Willie Francis was to be re-executed. Gruesome Gertie had haunted the dreams of many a condemned man in Louisiana. Willie was the twenty-third person to take the deadly current, but the first to survive an electrocution. By the 1940s, executions were private affairs. They took place behind the walls of prison complexes, and the most anyone might see of them would be a hearse driving out with a coffin loaded in the back. But Louisiana had a traveling electric chair that turned an execution into a bizarre, macabre road show. A crowd would often gather to watch prison officials unload Gruesome Gertie and bring her into a parish jail. The chair would then be attached to two long, black, snake-like cables that would lead back to the truck, plugged into a powerful gasoline engine in the back that gave Gertie her juice. The engine was loud, and people were drawn to the noise from blocks away. 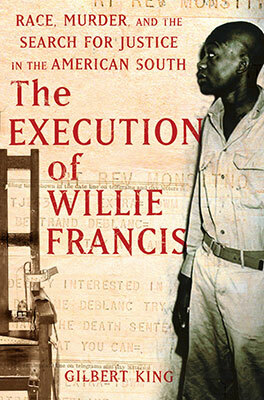 On May 3rd, one of the people in the crowd in St. Martinville, Louisiana was Frederick Francis, Willie’s father. He’d arrived with a coffin and was seen pacing back and forth beneath a live oak tree, waiting to claim the body of his youngest son. 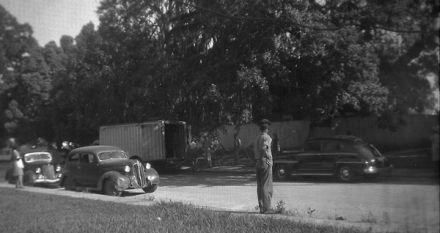 I’d been working on my book, The Execution of Willie Francis for nearly two years, but had never seen a picture of the truck that had delivered death to so many condemned men (and one woman, Tony Jo Henry) in Louisiana. I’d read about it in countless newspaper stories, as well as in Ernest Gaines’ book, A Lesson Before Dying, which was loosely based on Willie’s story. But it wasn’t until I had the opportunity to go through the legal files of Bertrand DeBlanc, the lawyer who took Willie’s case after the botched execution, that I ever got a glimpse of the truck. DeBlanc lived across the street from the St. Martinville jail, and when the truck parked in front of his house, he was just another curious onlooker who went outside with his Brownie camera to take pictures. 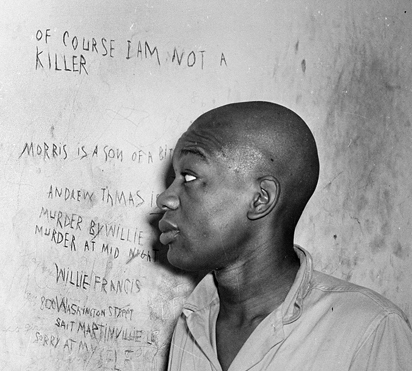 The photographs DeBlanc took on that fateful day not only provide a record of one of the most famous execution attempts in this country’s history, but they also serve to illustrate the inequity of the death penalty in the south at the time. Lynchings were becoming less common, but the implied bargain of swift justice pacified the vigilante cry for death. This innocuous looking truck rolled through small Louisiana towns to execute mostly black men at the hands of white law enforcement officials. But when townspeople gathered around, and the doors swung open and Gertie was taken up the back steps and fired up, the spectacle of this traveling show of death sent as strong a message to blacks as any public mob lynching.